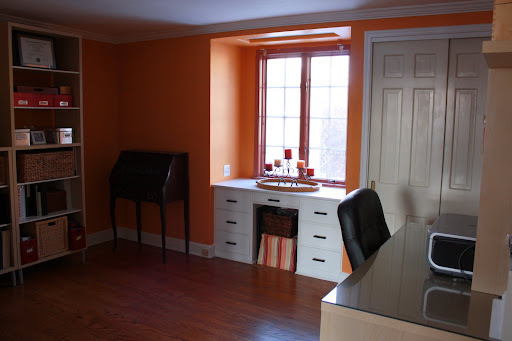 The lovely orange room that I showed you a glimpse of in my sticky and stanky makeover post was full of drama. We're talking tears, anger and excessive amounts of paint and primer-slinging. But, I saved the best for last. This wallpaper came off in SHEETS, people! I wish I would've taken it all off in 2008...alas, you never really know how it's going to come off until you get to strippin. Do I get bonus points for most creative use of a treadmill? Man...I wish the wallpaper (probably original from 1934) we scraped in our house came off like that! I'm thrilled it came off in sheets for you! That's so incredibly rare (it seems). Yee-ha!!! Oh my gosh. I would like to physically harm whoever caulked those beautiful doors! Seriously, what was she smoking when she did that?! This is the ONLY blog I've ever read where I enjoy the before and during posts just as much as the afters. I have a co-worker that moved into an 1800's house and am so disturbed by the previous owners. 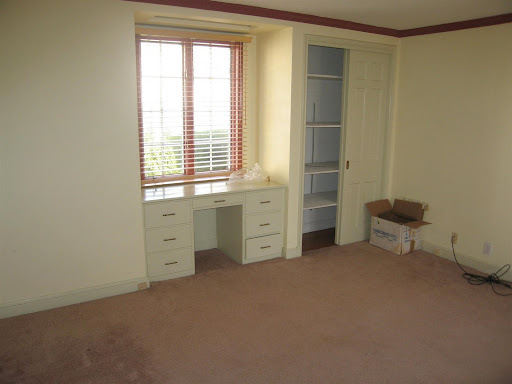 They covered up gorgeous beadboarding on the stairs, "renovated" the kitchen with salmon pink counter tops and light wood cabinets, lowered the ceiling to hide the crown molding and covered up the original hardwood floors with stick on tiles. To me, that (like chaulking those gorgeous doors) should equal jail time. Who are these people?! Your house is so lucky to have you as an owner! My home went through some stupid decorating before I moved in. It was a wallpaper haven!! I never understood what made people cover hardwood with a crazy color carpet! Woo Hoo for motivated lunch breaks! we had one room that the wallpaper came off in sheets like that, and it was such a nice surprise. are you going to paint it orange again? Sara ... I'm sure that taking down the wallpaper was just a much of a workout as walking on the treadmill ... good use of the machine. Don't you love it when something you think is going to be horrendous turns out so easy! Of course, now you have another whole project. 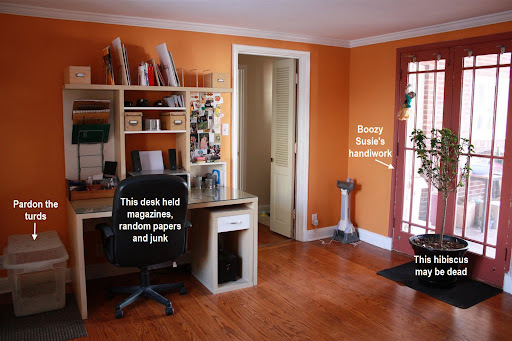 PS ... you have really lovely sized and architectually interesting rooms in your house. I'm envious. My whole house has sheets and sheets of wallpaper too- like, 3 or 4 layers of it. I did what your mom suggested and just painted over all of it when I moved in, because there were so many other *issues* that were grosser and more urgent. I'm pretty used to it now, but sometimes I do catch a glimpse of a seam and it makes me just want to grab a corner and riiiiip! Anyway, the room already looks a thousand times better than when you moved in. I don't envy all that scraping! I love seeing the "what where the last owners THINKING" moments in other people's home - we sure have a lot of them at our house, too! Looking good so far!!! Wow, wish ours had come off like that. Looking forward to your next reveal. Oh I feel your pain! 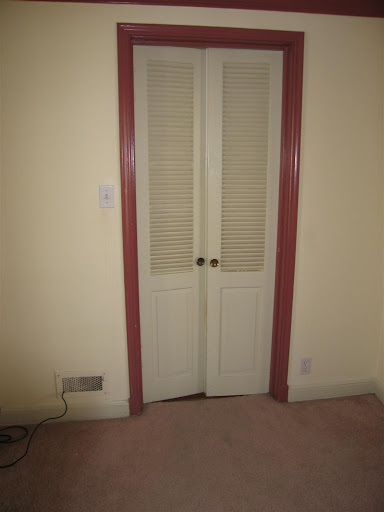 We had red/pink trim in our previous house mixed with....wait for it...painted navy blue doors. It was hot. What are people thinking when they do that? 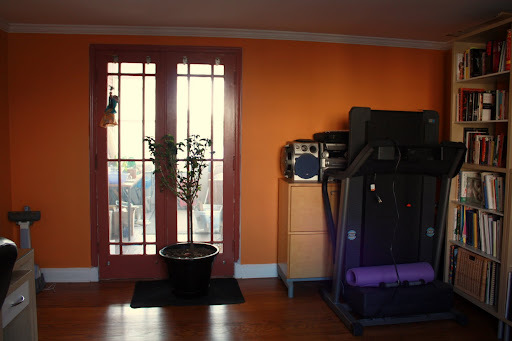 Love the new use for the treadmill! What the heck was Boozy Susie thinking?!? You get an A+ for putting that treadmill to good use. Wow, that's a lotta wallpaper! Glad to hear it came off that easily though! 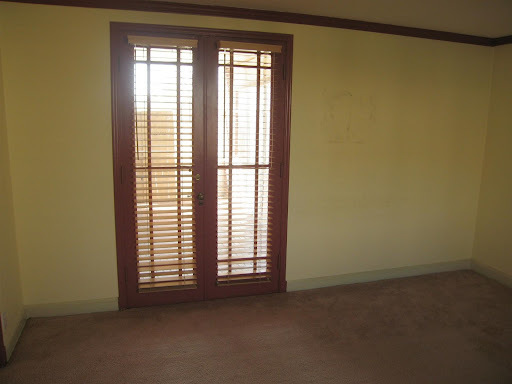 I am loving those French doors, even if they still need some TLC! Whoa! That's some crazy wallpaper removal! At least it's coming off easily - even if you did have to wait to find out! Caulk a door shut - I've heard it all now. You guys really do deserve a gold medal for all this work. One of my good friends would feel your pain with that goop from the carpet pads. 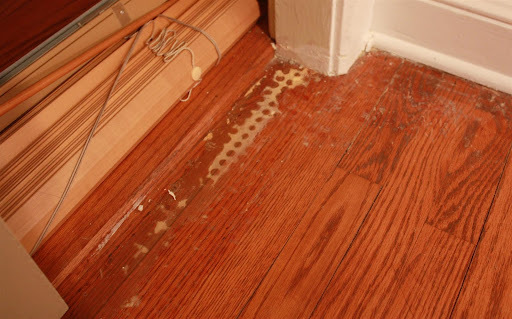 She bought an older house with all the hardwood floors covered with carpet. We had a carpet ripping up party - they must have used staples on every darn inch of her floor. We finally got them all out only to discover that in the hall way between all the bedrooms... the previous owner laid down faux wood sticky sheets in the hallway. I guess maybe something happened to the wood floors there. She still hasn't gotten all of that unstuck yet!! !